For me, the new year is always a chance for a fresh start. After the heavier holiday meals, I spend my January coming up with light and easy dishes that I can serve up to my family or enjoy quickly for lunch at home. Most of you already know that over the last six months I’ve been on a mission to rethink the way that I eat and learn to make better-for-me choices, and one way that I’m doing this is by coming up with easy recipes that boast bold flavors, lots of protein and tons of veggies. While my arsenal of better-for-me recipes is steadily growing, I have to admit that I’ve fallen in love with one dish in particular. 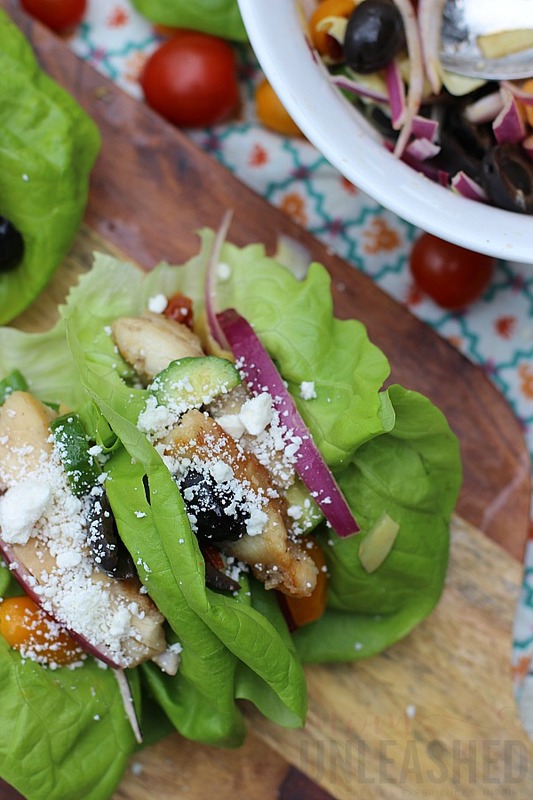 Whether you’re trying to eat better, want to lighten up the new year, or simply love bold flavors, you’re going to adore my Mediterranean Chicken Lettuce Wraps. I will be the first to admit that I love grab-and-go meals. My busy life isn’t always conducive to plates and utensils, so for years I’ve adored dishes that I can make quickly and enjoy at my kitchen table, at my desk or even on the go. However, as I’ve embarked on this better-for-me lifestyle, I’ve learned that when it comes to making the best dishes, there are a few shortcuts and substitutions that always ensure delicious success. 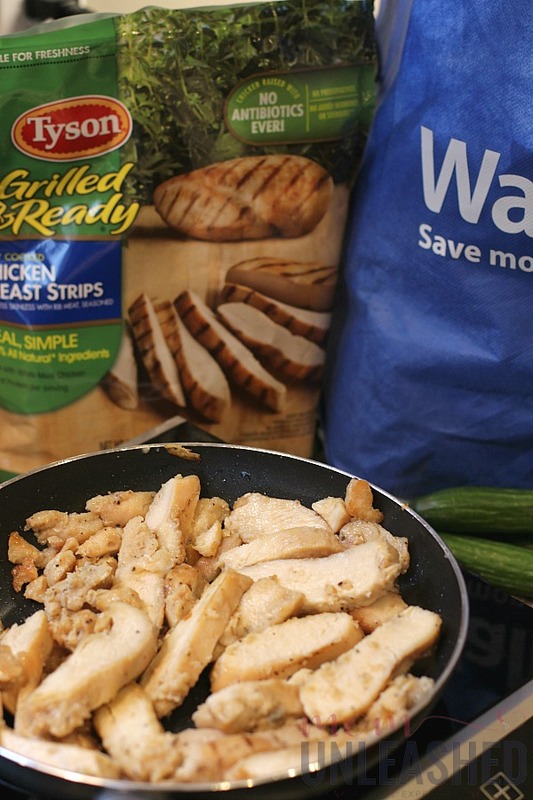 One of my simple hacks, that saves me every time, is having Tyson® Grilled & Ready® Fully Cooked Grilled Chicken Breast Strips from Walmart in my freezer (hint, hint…from 1/12/19-2/10/19 you can save $1 on Tyson Grilled & Ready products at Walmart with this Ibotta rebate offer! These delicious 100% all natural, made with white meat chicken strips have always been easy and convenient. When it comes to making better-for-me meals quickly, now I can use Walmart Online Grocery Pickup to purchase them. I’m even more in love! 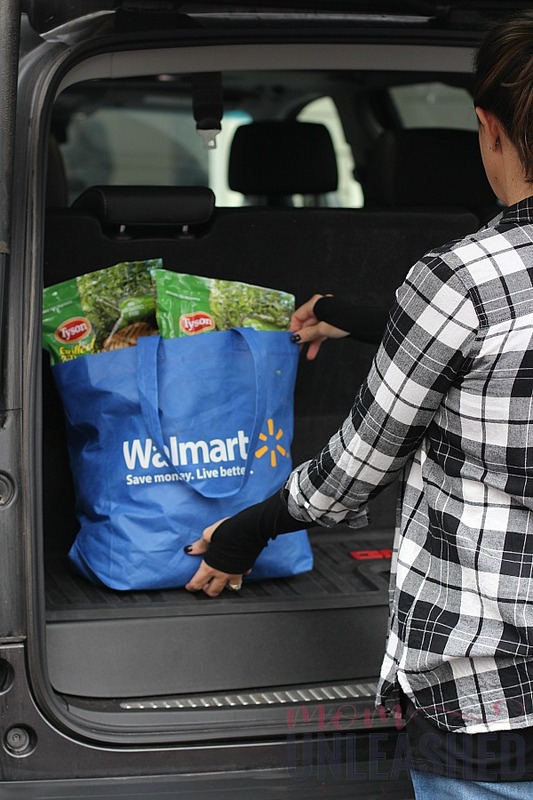 For you busy mamas who need a better way to stock up, Walmart’s Online Grocery Pickup program is uh-mazing! 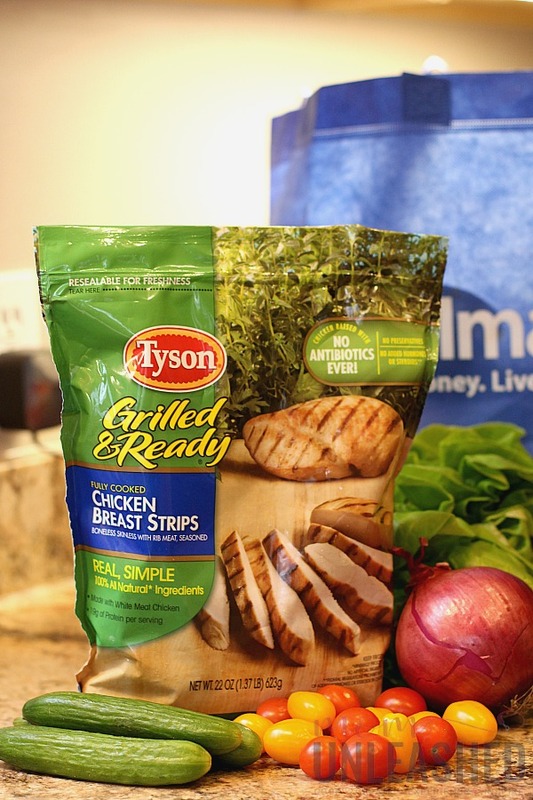 Just order items like my beloved Tyson Grilled & Ready Fully Cooked Grilled Chicken Breast Strips online, schedule your time for pickup and swing by your local Walmart where a helpful associate will load them into your car. That means no getting the kids out to go in the store and no need for an hour of your day to be dedicated to shopping! Awesome right? 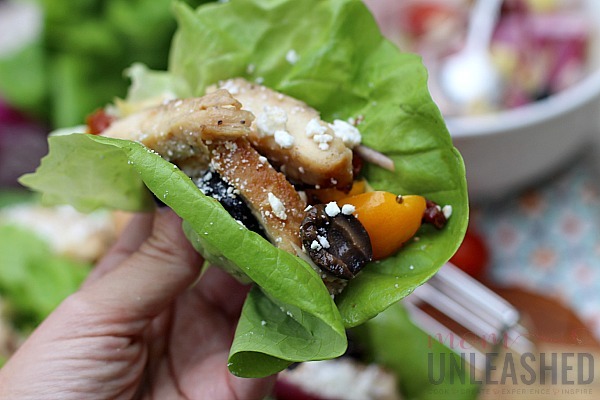 So now that you know my main secret to whipping up better-for-me meals quickly, I want to show you my favorite way to use Tyson Grilled & Ready Fully Cooked Grilled Chicken Breast Strips right and share the recipes for my delicious, make-your-mouth-water Mediterranean Chicken Lettuce Wraps. 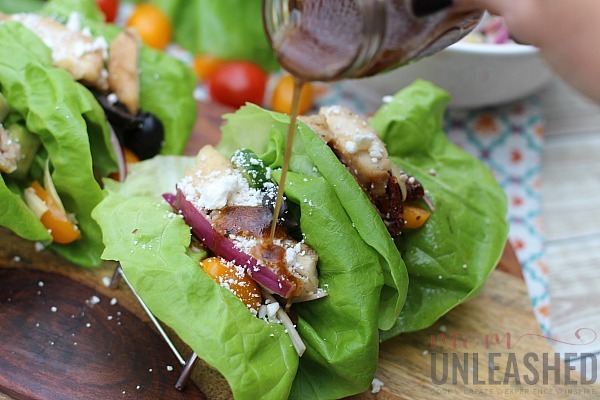 These Mediterranean Chicken Lettuce Wraps are a lightened up lunch or dinner idea that are bursting with flavor! Saute the Tyson Grilled & Ready Fully Cooked Grilled Chicken Breast Strips in the olive oil until they are cooked through completely. 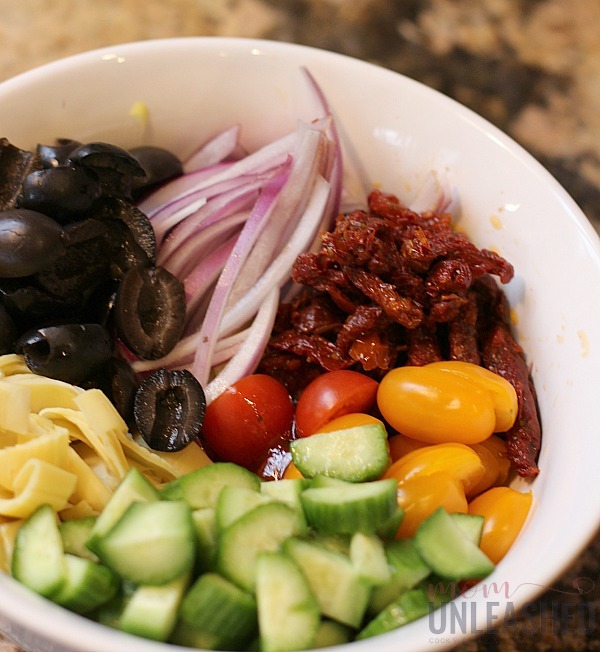 Slice the red onion, artichoke hearts, black olives, sun dried tomatoes, cherry tomatoes and cucumber and add them to a bowl. Toss the veggies in the balsamic vinaigrette and set aside. Lay our your pieces of butter lettuce and fill each one half way with the veggie mixture. 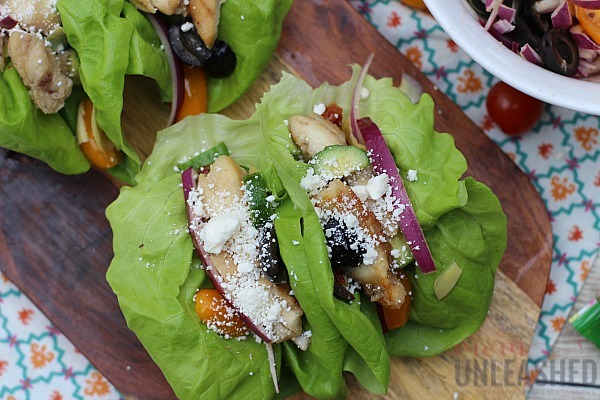 These Mediterranean Chicken Lettuce Wraps are so easy to make and will literally have your taste buds dancing! To start them, I simply sauté my Tyson Grilled & Ready Fully Cooked Grilled Chicken Breast Strips with a little bit of olive oil. This is currently my number one shortcut to creating awesome, better-for-me meals quickly and easily since the chicken only takes minutes to heat. This freezer essential in my meal plan can be found in the freezer aisle at Walmart (or purchased using the Walmart Online Grocery Pickup service!). Since Tyson Grilled & Ready Fully Cooked Grilled Chicken Breast Strips have 19 grams of protein per serving and no antibiotics ever, they are a perfect way to add a quick, easy and delicious protein element to this dish! While my Tyson Grilled & Ready Fully Cooked Grilled Chicken Breast Strips are warming, I slice my red onion, artichoke hearts, black olives, sun dried tomatoes, cherry tomatoes and cucumbers and add them to a bowl. Then I simply toss all my veggie goodness in balsamic vinaigrette. Once my veggies are ready, I lay out my butter lettuce (you can use any type of lettuce but I’ve found this is the best kind for awesome wraps) and spoon my marinated veggie mixture into the bottom. Next, I add my Tyson Grilled & Ready Fully Cooked Grilled Chicken Breast Strips to the top of my veggies for a flavorful, protein-packed way to make my meal delicious. Once my Tyson Grilled & Ready Fully Cooked Grilled Chicken Breast Strips are in place, I sprinkle a little feta cheese over the top and if I want even more flavor, I drizzle a little balsamic vinaigrette over my chicken. In just minutes I have a better-for-me meal that’s packed with protein, bursting with flavor and is low on carbs. 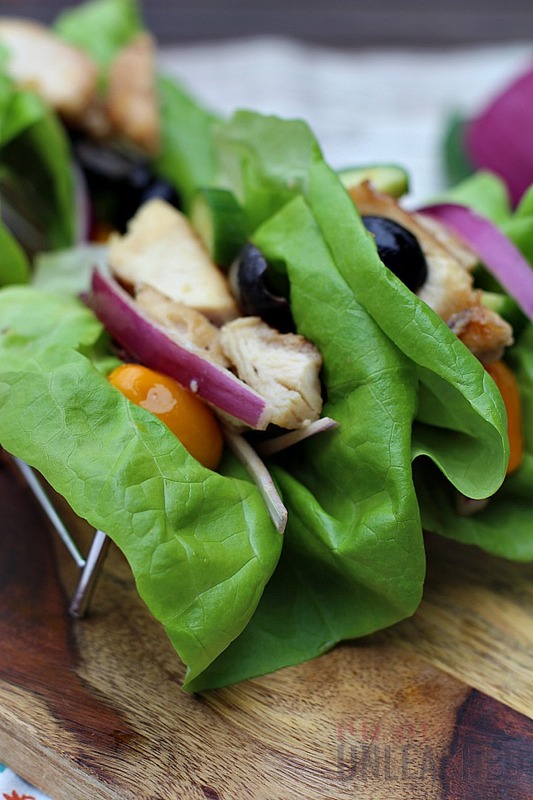 While I always have Tyson Grilled & Ready Fully Cooked Grilled Chicken Breast Strips on hand and substitute lettuce wraps for traditional wraps every time, this specific flavor combination has become my go-to when I want an easy, better-for-me meal that will leave me drooling. Whether you’re ready to whip up these Mediterranean Chicken Lettuce Wraps, want to create a simple Chicken and Zoodles dish, or are looking for a perfect protein to dip in your own Greek yogurt sauce, trust me when I say that your freezer needs to be stocked with Tyson Grilled & Ready Fully Cooked Grilled Chicken Breast Strips this January! To help you accomplish that goal, be sure to grab this Ibotta rebate offer for $1 off Tyson Grilled & Ready products from 1/12/19-2/10/19! Whether you use it in store at Walmart or in conjunction with Walmart Online Grocery Pickup, it’s a great way to save on a better-for-you essential that can help you create endless snacks, lunches and dinners! 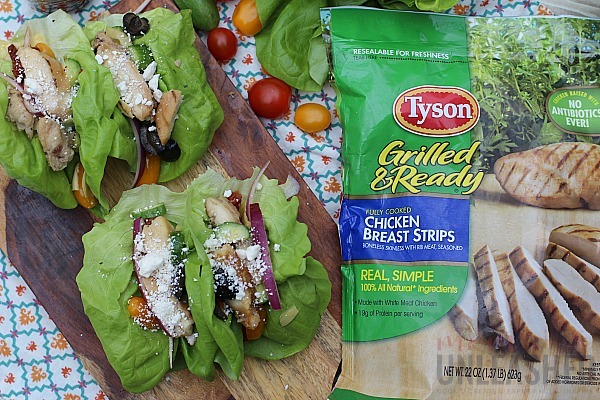 Now tell me, what’s your favorite better-for-you recipe made with Tyson Grilled & Ready Fully Cooked Grilled Chicken Breast Strips? I love all the flavors here, and I adore how healthy this is! I can’t wait to make these for the fam. These are looking really tasty! Definitely a good lunch idea for me and the easy prep is a bonus! I think it makes cooking and eating a happier experience for the entire family. I agree that having some pre-cooked or pre-made ready to heat staples makes a really big difference in not only prep time but one’s willingness to make fresh food on a regular basis. Anything that is easy prep and can be a grab and go staple in a busy house makes a big difference in not opting for the fast food. Those are some yummy wraps! I love making wraps in the warmer months. Stashing this for future reference! A delicious easy to make meal. Love that Chicken, a huge time saver on busy school nights. Mediterranean is my favorite flavor. All these yummy and healthy ingredients! I won’t stop on snacking on these! Love everything in your wraps! Can’t wait to try them! They are perfect for my health goals! This is what we will have for dinner on Saturday. The kids will be heading over to my sister’s house as she needs some help moving heavy furniture. So it will only be me and my husband who will feast on these lettuce wraps. Yum.